The only public access point for the new conservation area is at the end of the pavement at 3714 S. Thierman Road. There are no signs and no official parking area has been established. Spokane County parks officials closed deals Friday to acquire 269 acres in the Glenrose area to be protected open space. Two adjoining parcels were purchased with $473,500 from the Spokane County Conservation Futures Program plus $257,500 donated by the Dishman Hills Natural Area Association, said John Bottelli, county parks assistant director. The 109-acre McCollum property and 160-acre Stone estate are between the Dishman Hills Natural Area to the north and the Iller Creek Conservation Area to the south. Spokane County commissioners approved negotiations for the acquisitions in October. The land holds excellent wildlife habitat and offers scenic views from high ridges over the Spokane Valley for hikers, horse riders and mountain bikers. County conservation areas are not open to hunting or motorized vehicles. “This combined acquisition locks in a major hub in the ‘Dream Trail’ corridor, and moves us one step closer to the long-envisioned goal of one day connecting Camp Caro at Appleway Avenue with Big Rock on Stevens Creek Road,” Bottelli said. The Dishman Hills Natural Area Association was founded in 1966 to protect what have become popular wildlands in the valley. 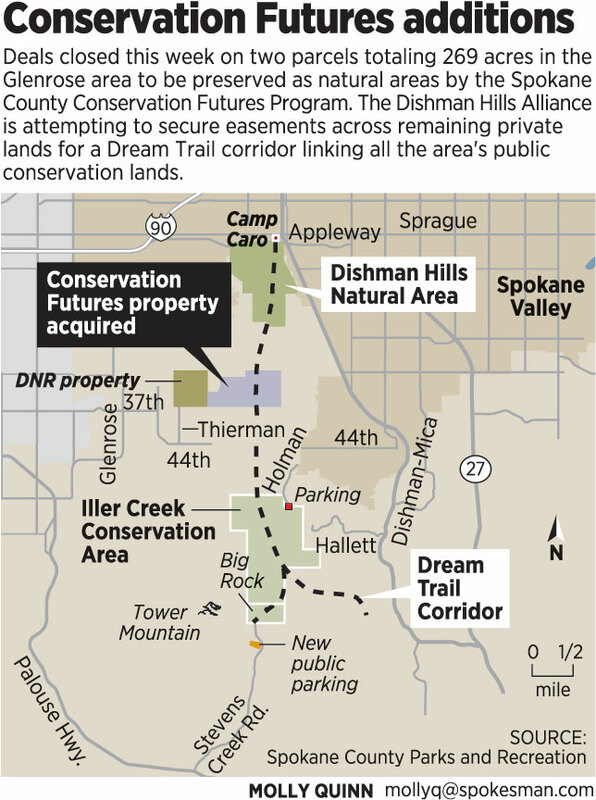 The Dishman Hills Alliance, a coalition of about 20 organizations, grew from the original association in a decade-old effort to secure a corridor for wildlife movements and public access through the Dishman Hills past Tower Mountain. “In some cases, we’re looking for easements rather than purchasing the land,” said Jeff Lambert, an alliance organizer and member of the Spokane Mountaineers. The voter-approved Conservation Futures Program preserves open spaces with a property tax of up to 6.25 cents per $1,000 of assessed value. Since 1994, the county has purchased about 6,300 acres in about 30 acquisitions. The public can access the new Glenrose conservation area – not yet officially named – through 160 acres of adjoining state land managed by the state Department of Natural Resources. The only public access point is at the end of the pavement at 3714 S. Thierman Road. There are no signs and no official parking area has been established, Lambert said. “People will need to respect private land by parking off the side of the road and not blocking gates or straying onto private property,” he said.